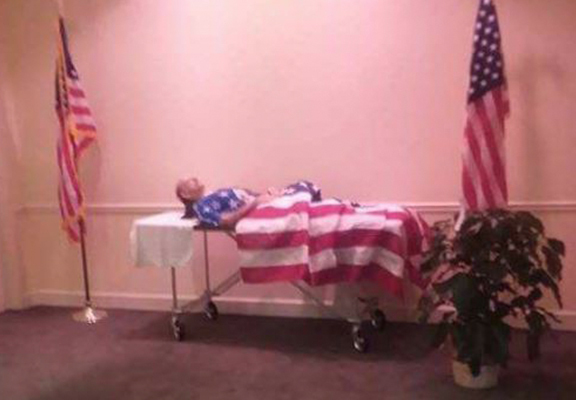 A funeral home has sparked outrage after a photo posted on Facebook showed a veteran’s body on a draped in an American flag without a coffin. 71-year-old Vietnam War veteran George Taylor died recently and his family members and friends had arrived at Heritage Funeral Home in Fort Oglethorpe, Georgia on Thursday to pay their respects. But when they arrived George’s body they were shocked to find that he was not lying in a coffin and was just laid on a table, Fox 5 reports. It turned out that the lack of a coffin all reportedly came down to an issue with a $9,000 (£7,000) payment that was supposed to come out of his life insurance. The insurance company allegedly claimed it needed to see a death certification before granting the payment, but the check just didn’t arrive in time. Pretty shocking to be honest. Family member Elizabeth Moss took to Facebook to share her anger at the situation. George’s son James told News Channel 9 said that even though this arrangement was agreed beforehand, he still understandably found the set up to be disrespectful. However, Ben Friberg, a Managing Partner at Heritage Funeral Home, told Fox5 that there were a lot of inaccuracies on social media and it didn’t tell the whole story. We did everything as we were instructed to do by the family. Every family we serve has a way and reason for why they want to do things. We do that because it’s an honor for us to serve all families. Money is not an issue. Money is never an issue for why we sould serve a family. Our hearts are broken with how we’ve been portrayed by the news and social media. Family members have gone on record to say our funeral home has done nothing wrong. We take the utmost care and dignity, and there was never anything done because of negligence. Ben added that the family wanted a small private viewing, and that it is not uncommon for bodies to be displayed this way. Regardless, this is no way to treat a man who served in the U.S. Army for 15 years and did two tours in the Vietnam War. He deserved so much more respect when he passed.